Pakistan are once again unstoppable in the ongoing three-match T20I against Australia in UAE. The hosts have registered a comfortable 11-run win in the second T20I to take an unassailable lead of 2-0 with a match to go in the series. Having opted to bat first, Pakistan got to 147 for 6 in their 20 overs courtesy two scores of 40s from Babar Azam and Mohammad Hafeez. Chasing a good total, Australia endured another top order collapse. Glenn Maxwell and Nathan Coulter-Nile then shared a good 7th wicket stand and at one stage threatened to take Australia over the line. However, Pakistan bowlers held their nerve to register a victory and take the series by 2-0 with a match to go. Here are some of the statistical highlights of the second T20I between Pakistan and Australia in Dubai. 45 - Runs scored by Babar Azam in the second T20I against Australia. His scores in his previous three T20Is - 97*, 51, 68*. Had he scored 5 more runs in this match, he would have become the first player from Pakistan and third overall to register four consecutive half-centuries in T20Is. Brendon McCullum (NZ) and Chris Gayle (WI) are the only players till date to register four consecutive T20I 50s. 2 - Twice in two matches in the ongoing T20I series Australian youngster Ben McDermott was dismissed as run-out. Coincidentally, he was dismissed by the same fielder (Fakhar Zaman) on both the occasions. McDermott remained undefeated on 10* (against UAE) in the only other T20I he played outside this T20I series against Pakistan. 59 - Partnership between Glenn Maxwell and Nathan Coulter-Nile for the seventh wicket. This is the third best 7th wicket partnership for Australia in T20Is. The 74-run stand between Mike Hussey and Steven Smith against Bangladesh in 2010 and 68-run stand between George Bailey and Pat Cummins are at the first and second in this list. 52 - Runs scored by Glenn Maxwell in this game. This is the maiden half-century for Maxwell in the 6 T20Is he played in UAE. His previous best was 27 (against Pakistan) in the year 2012. 10 - The series victory against Australia is the 10th consecutive series win for Pakistan under the leadership of Sarfraz Ahmed. 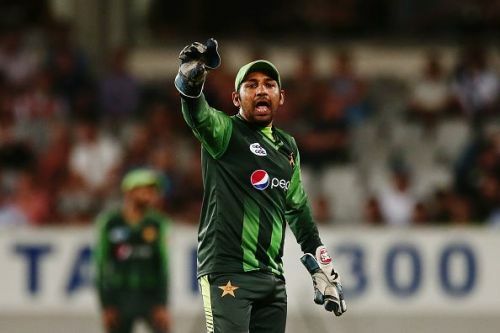 In fact, Pakistan are yet to lose a T20I series under the leadership of Sarfraz Ahmed. This winning streak for Sarfraz started against England in 2016. 25 - The win in the second T20I against Australia is the 25th win for Sarfraz Ahmed as captain in T20Is. He is currently fifth in the list of 'captains with most T20I wins'. Mahendra Singh Dhoni (41 wins), Asghar Afghan (34), Darren Sammy (27) and William Porterfield (26) are the captains ahead of Sarfraz in this list.